Prisoner of War mail, from Ruggero Bacci, handwritten in Italian, to his son Alfo Bacci, October 13, 1941. 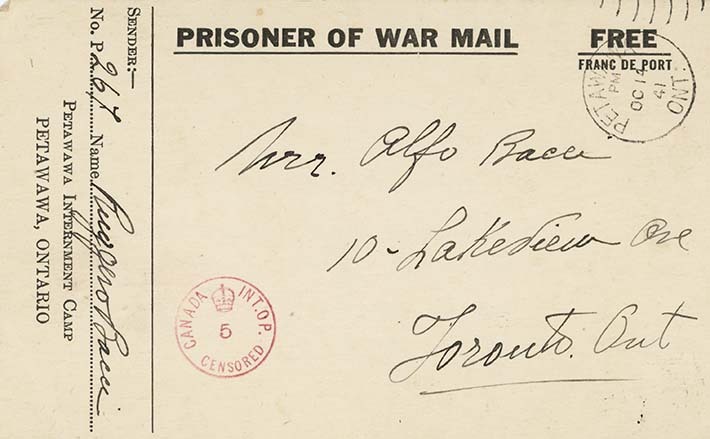 Internee Bacci writes to his younger son, Alfo, that he is pleased to hear that he is an honour student. He wishes him a happy birthday and writes that he hopes it is the last they celebrate apart. He says he's also sorry to hear about Grandfather, and hopes he is feeling better.